$1 million per claim/$2 million in the aggregate (i.e., for all claims made in 2019), applicable to claim expenses, indemnity payments and/or costs of repairs together. $5,000 per claim, applicable to claim expenses, indemnity payments and/or costs of repairs together (some exceptions apply). $2,950 per insured lawyer (plus PST). Required of all lawyers practising in partnership (including in MDPs or LLPs), in association, in law corporations with more than one lawyer, or as sole practitioners practising with employed lawyers. Also required of licensed paralegals practising in partnership with lawyers or as shareholders in combined licensee firms (CLFs). $250,000 per claim/in the aggregate, applicable to claim expenses, indemnity payments and/or costs of repairs together. $125 per lawyer or eligible paralegal licensee (plus PST). 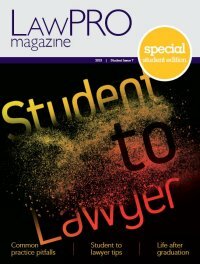 Required of all lawyers practising real estate law in Ontario in 2019.
those under investigation, where the Law Society obtains: an interlocutory suspension order or a restriction on the lawyer’s practice prohibiting the lawyer from practising real estate; or an undertaking not to practise real estate. $250,000 per claim/$1 million in the aggregate, applicable to claim expenses, indemnity payments and/or costs of repairs together. $100 per lawyer (plus PST). lawyer and/or paralegal shareholder) and sole practitioners practising with employed lawyers. to $1 million per claim/aggregate for an additional $125 per insured ($250 total Innocent Party premium). if acting as a locum, (you must carry at least the same amount of innocent party sublimit coverage as is carried by lawyers in the firm that has hired you). • $1 million per claim/aggregate. Underwritten on an individual basis, based on a risk assessment of information provided in the Innocent Party Sublimit Buy-Up application. 1. Includes paralegals practising as partners or shareholders in combined licensee firms. 2. Lawyers who are on temporary leave and qualify for exemption (c) are provided with the full limit coverage of $1 million per claim/$2 million in the aggregate provided under the base program. 3. Coverage for dishonest (as defined), fraudulent, criminal or malicious acts or omissions. 4. 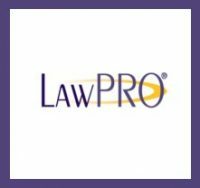 LawPRO strongly recommends that lawyers increase their optional coverage protection to the maximum sublimit offered, to provide comprehensive coverage and reduce the likelihood of gaps in coverage.